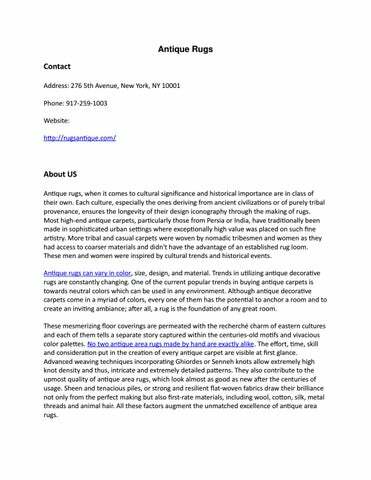 About US Antique rugs, when it comes to cultural significance and historical importance are in class of their own. Each culture, especially the ones deriving from ancient civilizations or of purely tribal provenance, ensures the longevity of their design iconography through the making of rugs. Most high-end antique carpets, particularly those from Persia or India, have traditionally been made in sophisticated urban settings where exceptionally high value was placed on such fine artistry. More tribal and casual carpets were woven by nomadic tribesmen and women as they had access to coarser materials and didn't have the advantage of an established rug loom. These men and women were inspired by cultural trends and historical events. Antique rugs can vary in color, size, design, and material. Trends in utilizing antique decorative rugs are constantly changing. 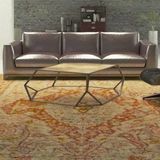 One of the current popular trends in buying antique carpets is towards neutral colors which can be used in any environment. Although antique decorative carpets come in a myriad of colors, every one of them has the potential to anchor a room and to create an inviting ambiance; after all, a rug is the foundation of any great room. These mesmerizing floor coverings are permeated with the recherchĂŠ charm of eastern cultures and each of them tells a separate story captured within the centuries-old motifs and vivacious color palettes. No two antique area rugs made by hand are exactly alike. The effort, time, skill and consideration put in the creation of every antique carpet are visible at first glance. Advanced weaving techniques incorporating Ghiordes or Senneh knots allow extremely high knot density and thus, intricate and extremely detailed patterns. They also contribute to the upmost quality of antique area rugs, which look almost as good as new after the centuries of usage. Sheen and tenacious piles, or strong and resilient flat-woven fabrics draw their brilliance not only from the perfect making but also first-rate materials, including wool, cotton, silk, metal threads and animal hair. All these factors augment the unmatched excellence of antique area rugs. Additional Details Working Hours: Mon-Sat 9 a.m â&#x20AC;&#x201C; 5 p.m Payment Accepted: Cash, check, all cc.